Speaking at a panel discussion in Dublin last December, Brian O’Cathain, who was Managing Director of Enterprise Energy Ireland when that company was the developer of the Corrib project, predicted that the project would never pay tax: "The problem with Corrib is that, because of the very long delay ... the project will never go into profit. The impact of that is that Corrib will never pay tax." “Corrib will probably pay little or no tax, for at least two reasons. Firstly, the licensing terms introduced by Ray Burke and Bertie Ahern mean that the developer can write off 100% of costs incurred over the past 25 years, including the cost of other unsuccessful wells, before declaring profits. Shell to Sea is a national campaign with active groups based across Ireland. The Shell to Sea campaign has three main aims. 1) To renegotiate the terms of the Great Oil and Gas Giveaway, which sees Ireland’s 10 billion barrels of oil equivalent* off the West Coast go directly to the oil companies, with the Irish State retaining a 0% share, no energy security of supply and only 25% tax on profits against which all costs can be deducted. 2) To have the Corrib gas field exploited in a safe way that will not expose the local community in Erris to unnecessary health and safety risks. 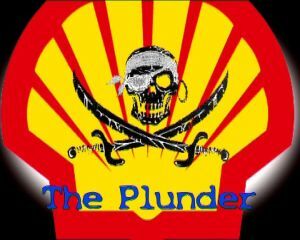 3) To seek justice for the human rights abuses suffered by Shell to Sea campaigners due to their opposition to Shell’s proposed inland refinery. *This figure is based on the estimate, issued by the Department of Communications, Energy & Natural Resources (DCENR) in 2006, that the amount of gas and oil in the Rockall and Porcupine basins, off Ireland’s west coast, is 10 BBOE (billion barrels of oil equivalent). Based on the average price of a barrel of oil for 2010 of $79, this works out at $790 billion, or €580 billion. This does not take account of further oil and gas reserves off Ireland’s south coast or inland. The total volume of oil and gas which rightfully belongs to Ireland could be significantly higher. Also, as the global price of oil rises in the coming years, the value of these Irish natural resources will rise further.